We are so happy to greet first days of summer – this magic time that everyone is waiting for! The season of sun, tan and fun! However, you should also be ready for UV rays and prepared for sweaty situations on sunny and extra hot days. The ultraviolet rays in the summertime can be dangerous if skin exposed on the sun without prior preparation. The skin on a different part of the body has different density and texture, therefore such parts as under eye area and others need special care and protection. Even sunglasses can’t always help from squinting your eyes on very bright, sunny days and this may lead to wrinkles around eyes and worn out the skin. Today, we are going to talk about Clarins Super Restorative Total Eye Concentrate and beautiful Chloe and Isabel Jewelry to benefit and sparkle your summer look. The Clarins Super Restorative Total Eye Concentrate is a perfect anti-aging treatment to take care of the around eyes and temple area. Some the of Concentrate ingredients are Organic Harungana extract to smooth wrinkles, Albizia to brighten dark circles, Guarana to reduce puffiness, Cassie Flower wax to soothe the skin. The Harungana tree grows in Africa and Madagascar and been used by locals for its therapeutic benefits. The leaves of the plant have healing properties and improve liver function and the sap of the plant has soothing and other positive effects on the skin. The eye concentrate is a white color cream, to apply – squeeze a little cream on the tip of your finger and warm up between fingertips before applying with massaging moves to around eye area and eyelashes. Drain the cream until fully absorbed by tapping fingertips on the area where concentrate was applied. 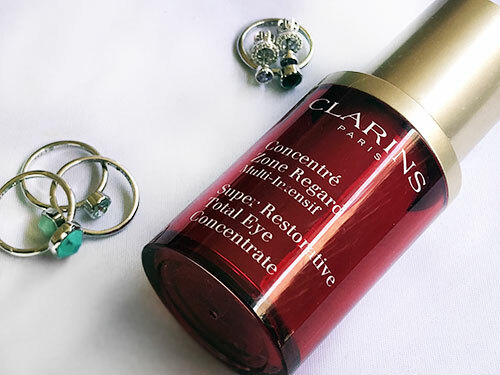 Our expert used Clarins Super Restorative Total Eye Concentrate and she reported that product gives better results than expected, skin looks smooth, elastic and healthy. She’s extremely happy with the result and suggests this product for the eye area. The Chloe and Isabel brand is based on the friendship philosophy concept where two different personalities united to create unique handcrafted jewelry. For our look we chose: Bead + Chain Multi-Wrap Bracelet, La Plage Tassel Earrings, Petits Bijoux Convertible Circle Studs and Minaret Hammered Stackable Rings. All items are in the silver and turquoise color style and look perfect with each other. The bracelet is made of mirrored opal glass beads, black diamond beads, navy thread and multi-wrap adjustable length chain that is closed on the button. The chain is silver plated and nickel free plating. It is a very stylish piece of jewelry! 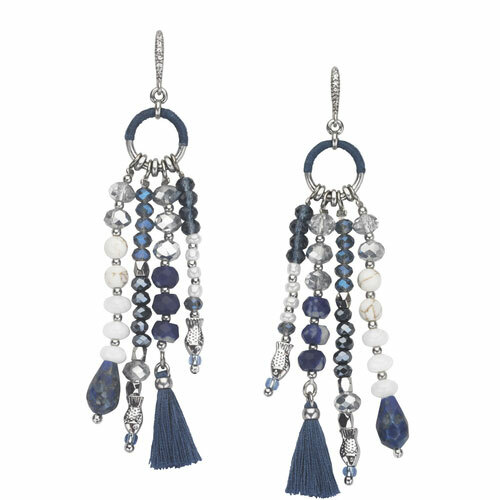 La Plage Tassel Earrings are the perfect jewelry to combine with the bracelet. The dangling earrings are made of semi-precious lapis, sodalite, clear crystal, blue, silver glass, pearl + blue seed beads, navy thread, pearlescent shell, and seed beads. The earrings have stylish sea-color sparkle. 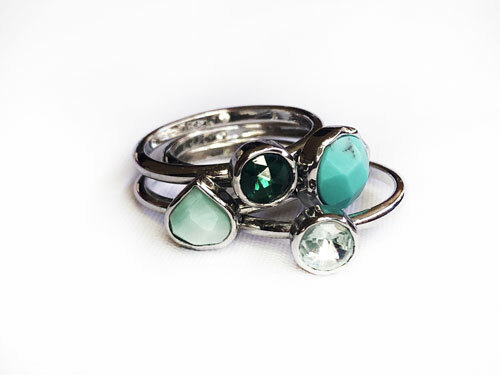 The Minaret Hammered Stackable rings – is set of 4 rings from light turquoise to a dark green color, that you wear together or solo. The rings are made with organic nature of semi-precious turquoise marbled chalcedony. The Petit Bijoux Convertible Studs that are fully customizable to fit the mood, birthday stone month and material as they can be silver or gold plated. You have choices between January: Garnet, February: Amethyst, March: Aquamarine, April: Diamond, May: Emerald, June: Alexandrite, July: Ruby, August: Peridot, September: Sapphire, October: Opal, November: Topaz, December: Blue Topaz. 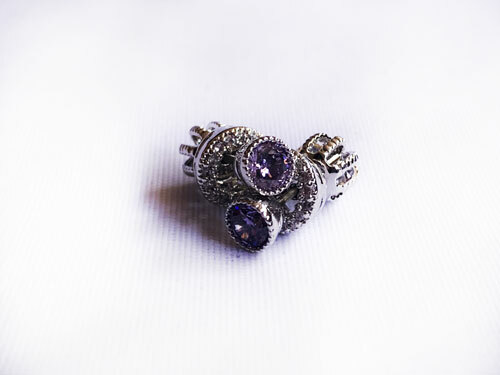 We are totally in love with Chloe and Isabel Jewelry and now you are too!